Are you looking for a relaxing holiday in the beautiful nature? With beach and mountains? Then choose the region of Le Marche (the Marches), a beautiful and quietly situated authentic area in the middle of Italy. Le Marche is located in the middle of Italy, next to Tuscany, and has a coastline of 175 km. 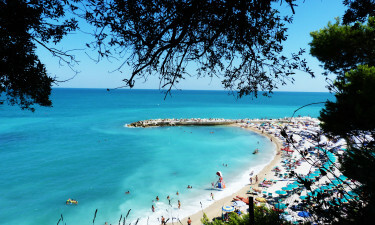 Le Marche starts just below the famous seaside resort of Rimini and ends just above the city of Pescara. The capital of Le Marche is Ancona. There are wide sandy beaches and small bays. Le Marche is a particularly varied region. You will find not only beaches but also mountains. The Monti Sibillini is a beautiful mountain area where you can go hiking, mountain biking or swimming in one of the mountain lakes. 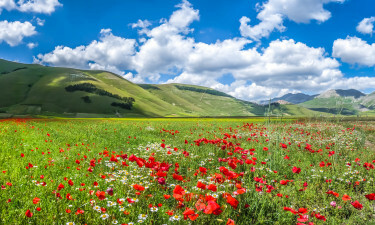 One of the most beautiful places in Central Italy is the plateau of Castelluccio, on the border between Le Marche and Umbria. Here lentils are grown and you will find fields full of poppies. A beautiful hiking area.